The Content, Marketing & Sales technology digest. Great ideas and advice to strengthen your core business. No matter what kind of business you own, if you don’t want to miss tons of leads, you need a website. You also need to keep it alive: fresh content, no broken links, and up-to-date design. And if you’ve been putting off your website’s launch or redesign for ages, it’s time to give it the deserved attention! Small businesses normally have limited budgets, so they think that a brand new design for their site is something they can’t afford right now. Bigger companies, too, are often guilty in neglecting their website’s look for years, as they prefer investing into advertising and other marketing channels. But what both should know is that a brand new design for their web page can cost just a hundred or two, while the positive results will be much more than this minor expense. That is possible with a predesigned theme for a content management system, like Joomla or WordPress. This time we have selected twenty fresh themes for the lucky owners of Joomla-powered websites. An interior design studio, a restaurant, or a spa salon – these templates are created for a variety of businesses, so you are very likely to find the right design for yours! Only here and today you have the wonderful opportunity to get one of the Joomla Themes for a discount price if you are an avid reader of Corephp Blog! If you want to get 20% off, just type in “Corephp” in promocode field when you do the check out. Don’t waste your time and click here to find the best Joomla Templates. Hurry up, the time is limited, you have only a month(till February 15th)!!! 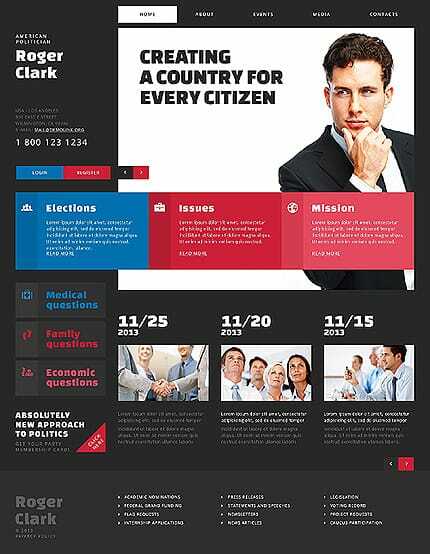 Now, what do you get for your money when you buy one of these Joomla templates? The best thing about ready-made themes is that they are not only cost-effective, but also very fast to install and set up. With a custom-created theme, you need to wait for months until it’s ready, but a predesigned one lets you launch a new web page in just a day or two. If the website is not handy for the user, they will quickly move on to the next url, so make sure your web page is convenient for all types of visitors, including the growing share of mobile users. Get one of the responsive themes, and your website will adapt to any screen size of a smartphone or a tablet. All images used in the templates are included and licensed, so if you want to use them on your website, don’t worry about the copyright issues. Sometimes you can’t find a perfect match, but all the themes are easy to customize. You can play with the images and the elements of the design to make it exactly what your business needs. 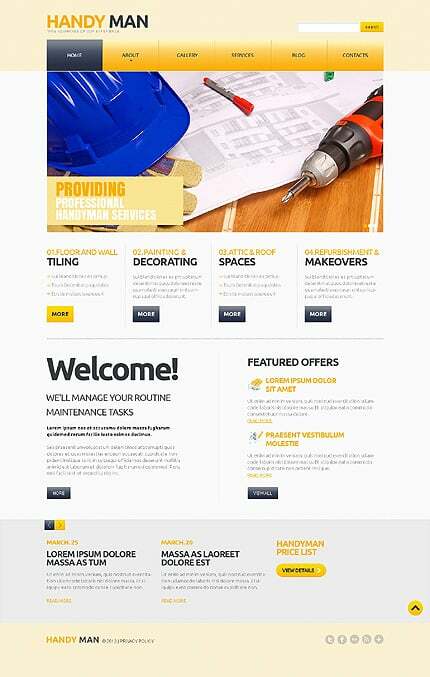 TemplateMonster.com, provider of these Joomla templates and the biggest commercial designs resource, offers round-o-clock customer support and optional help with installing, setting up, and customizing your theme. We hope you’re already convinced, so let’s move on to the designs and see which one will work for your website. Using dark gray and a textured background, this big-resolution design looks elegant in a masculine way. 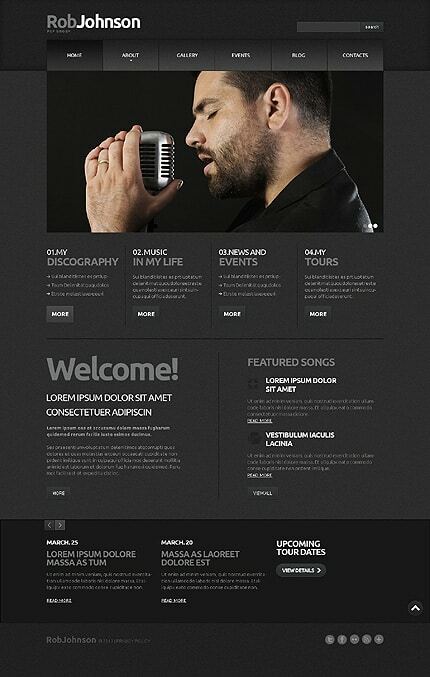 It’s a good choice for the web page of a male singer. The reserved colors of this design are livened up with glossy icons and buttons. 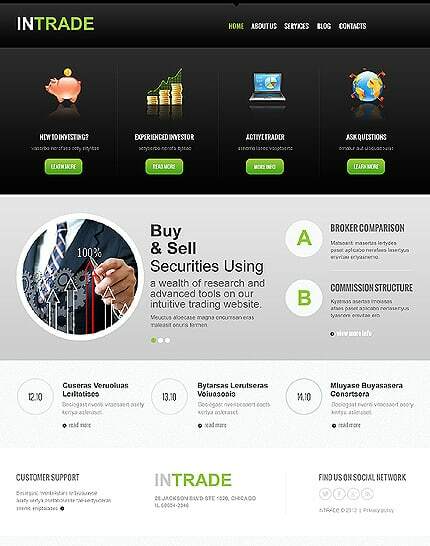 It’s a great theme for a corporate website, for example, the website of an investment company. This mobile-ready template uses classic colors and simple lines, and the unusual feature of the lightbox makes it more original. It will work well for the web page of an interior design studio. Combining lots of white with big, vivid images and pretty fonts, this gorgeous responsive theme is a find for any restaurant that wants to redesign its website. With a pleasant shade of teal and big photos in the lightbox, this mobile-ready theme looks stylish and will work well for a fashion blog. This clean responsive template is made more original with an unusual photo collage on top and the fancy fonts in the header menu. It’s a great option for the website of a model agency. The pastel color scheme of this mobile-friendly big-resolution design gives it a soft and relaxing look. It’s perfect for a spa salon. Using white and sleek gray, this responsive theme looks clean, even though the homepage is rich in content elements. It’s a professional-looking template that will work well for a management company. The classic color scheme and the flat elements make this responsive design look serious and modern. It’s a good choice for the web page of a political candidate. With a metallic logo and 3D-ish icons, this design has a slick look and will be a good option for the website of a hosting company. This clean mobile-friendly design looks lovely with its pastel details, pretty fonts, and gorgeous images in the big lightbox. It’s a tasteful and stylish choice for the website of a hair salon. With its dusty orange that is associated with tools and repairing services, this simple and professional design is perfect for the website of a maintenance services company. This clean responsive template looks uncluttered even though there are plenty of informative elements and content. It will work well for the website of a consulting firm. Combining white with a cold light shade of blue, this mobile-friendly template looks trendy and business-like. It’s a great choice for an outsourcing business’ website. 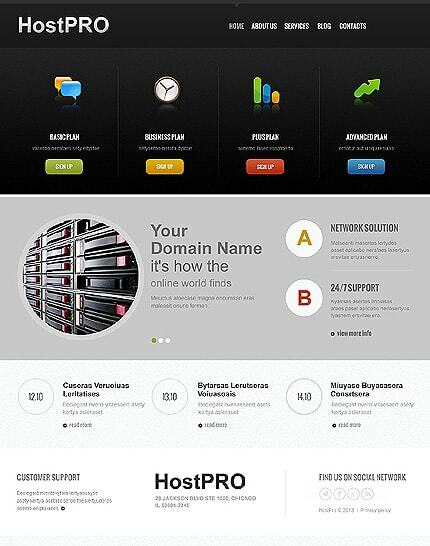 This responsive theme with its reserved colors has a smart, elegant look, and will be perfect for a management agency. Using black and yellow, the traditional taxi colors, this dynamic mobile-friendly design is a good choice for the website of a taxi service. This pleasant responsive theme uses subtle colors and a textured background, which in combination create a slightly retro look. It’s a great choice for the web page of a design studio. This big-resolution theme has a trendy look, with its colorful flat images. It’s the right choice for a photographer’s or videographer’s portfolio. The base of this responsive design is simple and reserved, which helps to highlight the portfolio items. 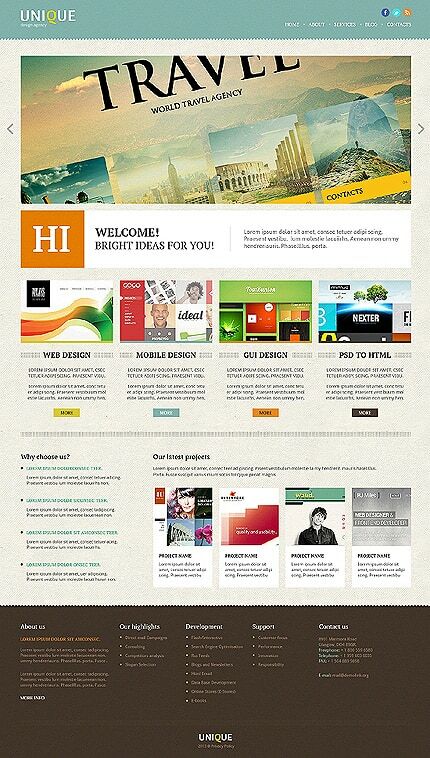 It’s a good choice for the portfolio of a web design studio. 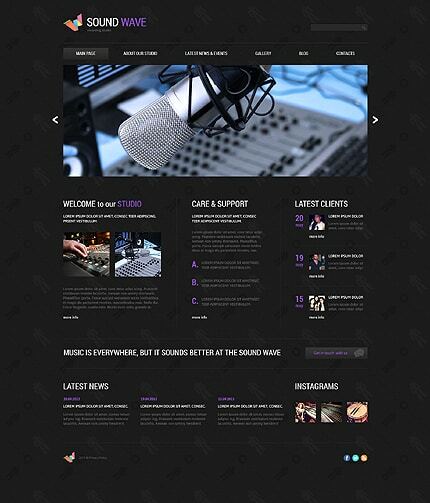 This is a stylish dark responsive theme with an interesting background and violet accents. It will work well for a recording studio. John Walker is a contributing author for the 'corePHP' blog. Business technology news, views and insights. 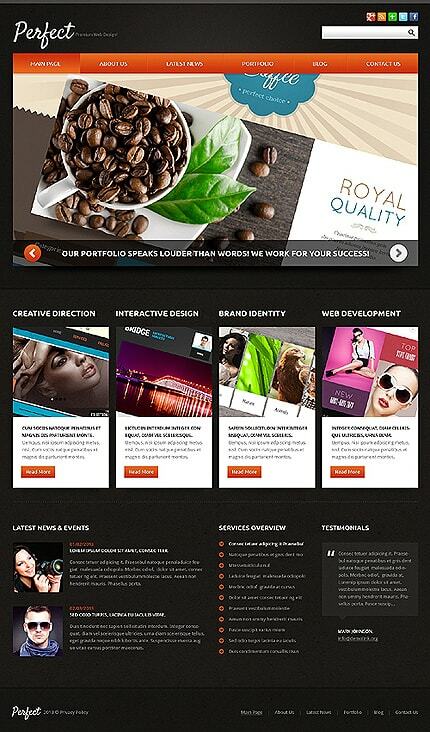 This entry was posted in Joomla, Templates and Themes on January 15, 2014 by John Walker. White Label SEO Services: What Are They and How Can They Benefit You?